Now that former Editor Sam Corrigan has left the AV and Install industry’s finest magazine, SVI (Sound Vision Install), to wander the corridors of academia as a trainee teacher (those that can’t, Sam…), I’ll be hopping back into the Editorial hotseat for the next two issues – a hotseat I orginally occupied back in 2003 when I first launched the publication, before sitting back with the knowledge of a job almost too well done as Editor-in-Chief from 2004-2011… and then sitting back further still to the point of horizontal when I went freelance last year. 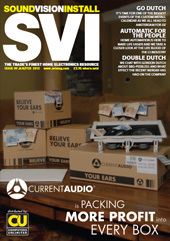 Lucky subscribers will be blessed with my unique powers of Editorship over both April (SVI Awards Special) and May issues, with fruity online ‘extras’ available too for SVI website looker-at-ers. Members of the public, feel free to follow and send images too. I’m not sure what of, but I didn’t want you to feel excluded.